I've seen this humorous sign warning drivers to keep an eye out for birds many times, but today I finally realized what it's talking about! 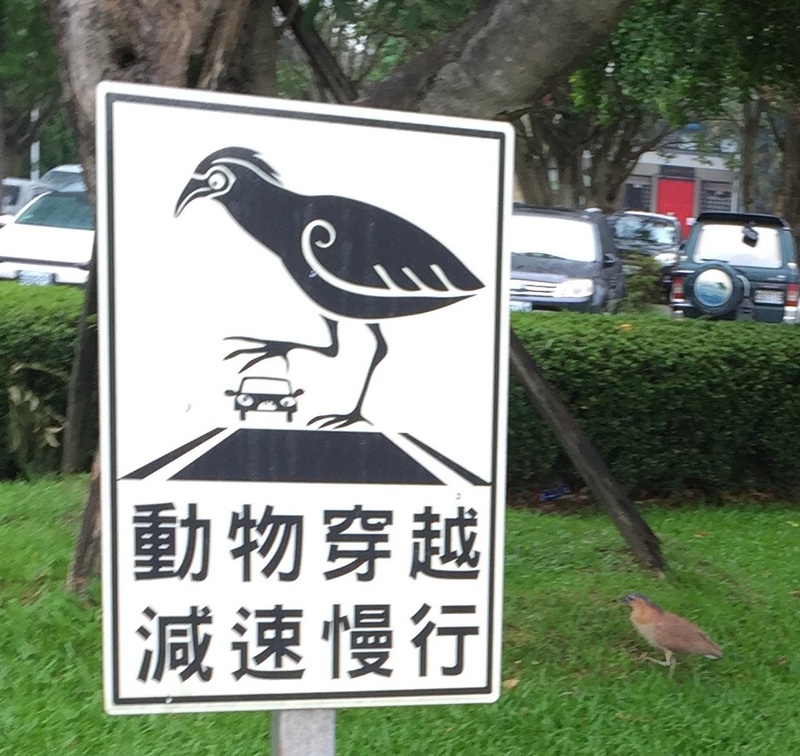 This is a large bird and I've seen it all around Taipei in gardens and green areas. It's not shy of people unless you get too close. I'd guess it's about 30 cm tall when standing upright, but it often is bend down looking for things to eat. It takes one step at a time, sometimes very slowly, and it's head moves out-of-synch with its body as it hunts for food. I am not sure if it can fly, I've only seen it on the ground, and I've never heard it make a sound. It's various shades of brown and tan, and just like the cartoon on the sign it has long feathers projecting backwards from its head. That can be seen in the center top of the photo montage. These are cell-phone photos from the closest I could get without it getting nervous. 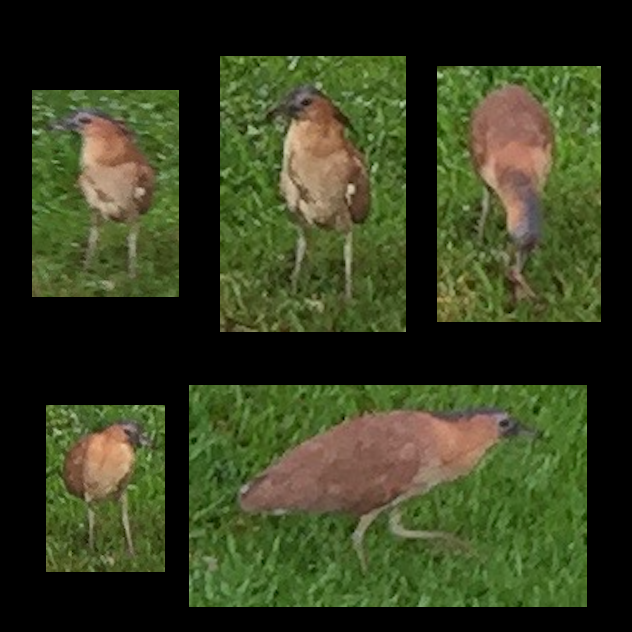 I am fairly certain that this is a Malayan Night Heron (Gorsachius melanolophus). 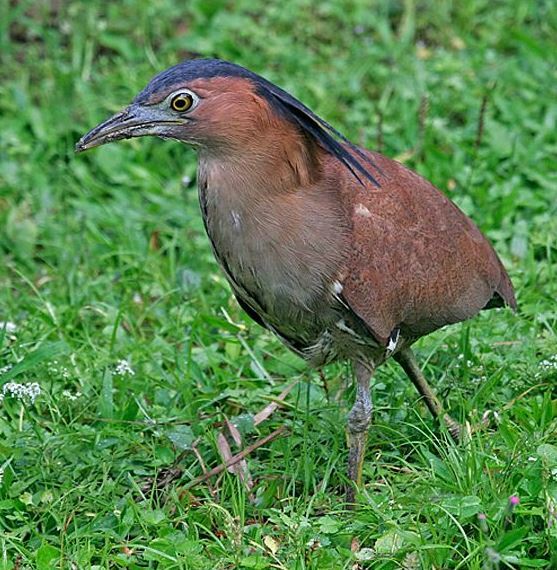 Taiwan is listed as one of the countries where the Malayan night heron can be found. Its diet consists of small reptiles, snails, chilopods, arachnids, crabs and insects. This would explain why you have observed it bend down a lot to look for food. Needless to say you can find more information in the corresponding Wikipedia article. In addition, here is a link to a video taken in Taiwan. Does this remind you of the bird that you saw?